For those unaware, there is a bit of a long-running argument between regions of New Jersey about the correct name for the sliced processed pork product found in every breakfast joint in the Garden State. In the south and central areas of the state, the name “pork roll” is preferred. In the north, a different and incorrect name is primarily used. This intrastate disagreement is so well-known to New Jerseyans that NJ.com set to finally put it to a vote through a reader poll last summer. We analyzed the results in a number of ways and found that the seemingly even divide between Taylor ham and pork roll is no myth – New Jersey is almost dead evenly split on the issue. But who won? Well it depends on how you look at it. NJ.com’s poll results point to a pretty decisive victory for “pork roll”, which makes sense since that is the only legitimate name for the product. The publication had to employ some convoluted superdelegate math to even make a case for the other side. Pork Roll or Taylor Ham? At the Jersey Shore, we’re all Pork Roll, and on August 18th, the BlueClaws become, for one day only, the Jersey Shore Pork Rolls for their game against the Delmarva Shorebirds. The BlueClaws will be wearing special hats and jerseys. The jerseys will be auctioned off to benefit BlueClaws Charities and their Community Partners Program. I’ve indicated the location of Lakewood on the map above with a white star. As you can see, Lakewood sits comfortably in pork roll country. As if there wasn’t enough to argue about, there is another less intense debate about the proper technique for cutting pork roll before it goes into the pan. People typically fall into two camps: four medium cuts around the outside, or one straight to the center. There are other ways to do it, of course. Some use three or five cuts or sometimes cut in half. There are even heard whispers of some making eight microcuts. I’ve always been a single slice to the center man myself, but as you can see, Lakewood decided to go with a design featuring the four medium cuts. I imagine that’s less about a cutting preference in Lakewood and more to make it easily identifiable as a slice of pork roll. Oregon State unveiled an “11 Strong” alternate uniform that will be worn against Minnesota this season. Oregon State players thought they were watching a movie preview during a night off from fall camp in Bend. Instead, they got a first glimpse of their “11 strong” alternate Nike uniforms, which will debut when OSU hosts Minnesota on Sept. 9. The uniform features a black helmets with a metallic silver Beavers logo and orange stripe down the center and a dark gray jersey with silver numbers/letters and the 11 strong logo on the chest. Debuting Sept. 9 under the lights of Reser Stadium. Willie Calhoun, who was traded from the Dodgers to the Texas Rangers in the Yu Darvish deal at the deadline, decided to edit the uniform in his Twitter avatar to reflect his new team. I’d say he nailed it. The Braves are breaking out the tomahawk caps for today’s game. 1. I have a new ESPN piece that tells the previously untold story behind the design team that created the Astros’ rainbow uniform. I’m really happy with this one, and I’ve also received a ton of positive feedback (thank you!). If you haven’t seen it already, I invited you to check it out here. 2. I’m running a new ESPN contest to redesign the Titans. Details here. It’s available in a bunch of colors. Full details here, or just go straight to the ordering page. It’s also available in women’s sizes. 4. We’ve also launched a bunch of new Naming Wrongs shirts yesterday, all of them pertaining to Seattle. Get the full scoop here, or just go straight to the Naming Wrongs shop. A+++ to Willie Calhoun for that awesome MSPainting!! It’s Dave. But I fully agree with you here! Is a pork roll just fried bologna? But what’s the difference? To me, it looks a like a mixture of thick bologna and kielbasa sausage. All this fuss for something that there are 30 variations of in any good German deli. It’s not Buffalo Wings, or KC Ribs or NY Pizza or Montreal Poutine. My dad & uncle from Roselle & then Scotch Plains alternated between pork roll and Taylor ham. I grill them and make more than four cuts typically. I will try the Pac man style some time. Rooting for Phil and his art today. Those are some spectacular offerings. Says Taylor Ham right on the package. This could not have been written better, John. Pork roll or GTFO. We don’t have it where I live, else I’d take your advice and get the fork out. I think they mentioned it in the ticker yesterday or Thursday. In the spirit of compromise I’m Calling It Pork Ham. Do they not sell bacon in NJ? Hold on, Gov Christie just called. Why yes, yes they do sell bacon in NJ. John Taylor’s ham is the original and best (imho). Case’s pork roll seems fattier and not as zesty or flavorful. Right or wrong…I have, and always will, call it Taylor ham, but I am aware of my surroundings and know to call it pork roll DTS so I don’t look like a BENNY. Going out for a Taylor ham, egg & cheese SPK right now!! Nicely done… John Taylor’s ham is the best and most correct pronunciation!! …which I’m sure is enough to unite all factions in New Jersey in a great big cringe. Rosenberg’s Deli and Tony’s Meats also use that term, as does my Jersey girl wife (originally from Union City). Taylor is the company. Pork Roll is the product (or at least is now). Taylor Ham is the original 19th century name and what is universally printed on diner and deli menus in the northern part of NJ. I didn’t know it had another name until I was in college at Rutgers. As for why, it’s salty, porky and a little crispy when griddled, and makes for a superior sandwich meat over bacon. Taylor ham/pork roll, egg and cheese is better breakfast sandwich by a long shot. Perhaps they went four cut so as not to be confused with a Pac Man logo? I will always call it Taylor Ham after reading this. Taylor Ham is the brand name, pork roll is the product. 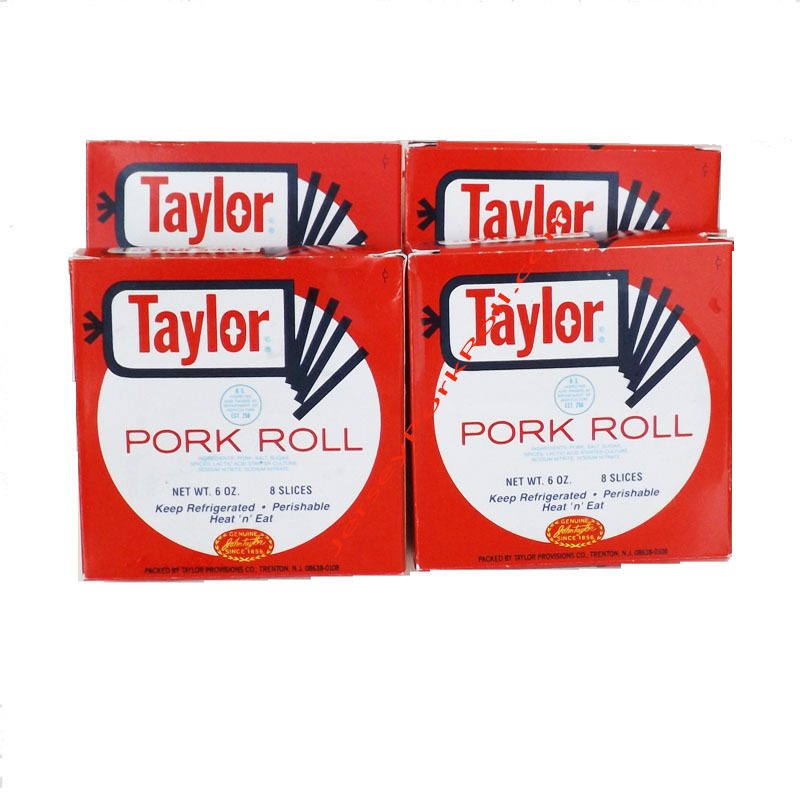 If you only intending on eating the brand name, I suppose it makes sense, but even then, you are ordering Taylor Ham pork roll. Cut wise, I am not sure why people feel the need for any cuts at all. I frequently make it, especially tailgating, and since you are flipping it while cooking, all you need to do is take a little care and press down the bubble on flipping. Since it cooks incredibly quickly its not like this is a labor intense process.